Coconut cake or we better said winko babat in Indonesian. 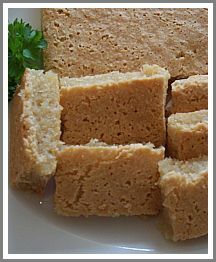 It is an original old Javanese dessert, but until now it is still a favorite cake by many Indonesian people. It has a great taste of vanilla and coconut together; it makes the cake very yummy. Try this unique coconut cake. Delicious in simplicity. It is light cake, even for you who might be don’t like sweet; this cake will do his best to overcome your taste buds. Really, this cake is the best part of Asian dessert. The look might be not so well that the taste would be under appreciated. But you have to taste it to know that this cake is really good. I have a girl friend. She doesn’t like anything sweet even ice cream doesn’t do well with her. She likes only savory cake and dishes. But when she tastes this cake, she really likes it. This is the only sweet cake that she likes. And above of all you don’t need special skill and so much time to make this cake. Mix all the ingredients together, and add some water until you get well mixture, not too thin and not too thick. Let it stand for 1/2 hour, pour it into the bakeware that has already been buttered first. Then bake it in the oven that has already warm on 175 degree Celsius for 50 minutes.